I like your yellow/peach flowers on the wreath. It looks very pretty. I love your beautiful cards!! Your colors are gorgeous!! Thank you for sharing!! Lovely cards! I really love the purples on the peony dreams card. Just gorgeous! TFS! Beautiful cards and I love the background die, it really sets off your designs! I am in love with the blue card! The background with the flowers is so striking. I love it! Your cards are so pretty and clever. I love the colors you used JJ.. the pretty florals on that teal background.. and the lavender for the flower. I had to look twice! That little lady inside is adorable! I love seeing you in action my friend! Your cards are rally beautiful! I love the pastel colors you chose for both cards! Thanks for the inspiration! 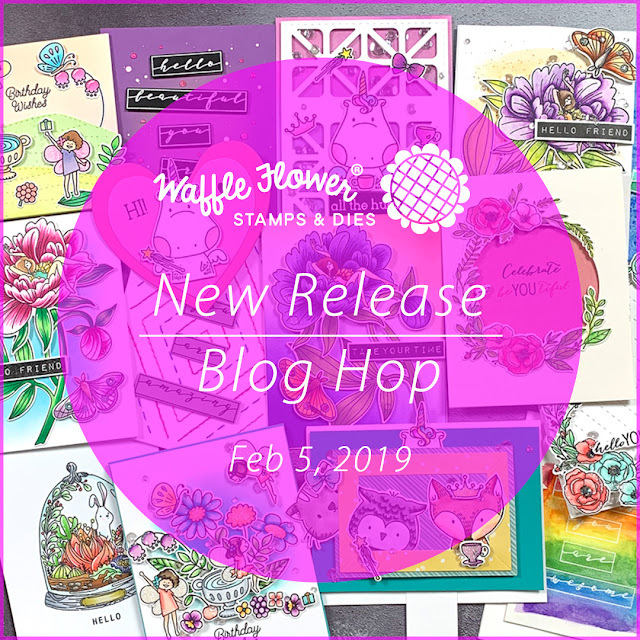 Such amazing new stamps and dies, dots and magnetic sheets to boot! OUTSTANDING! How exciting to use a die that you have designed yourself! The be you tiful stamp set is awesome and your card absolutely BEAUTIFUL! Gorgeous cards - love the colours!! Your cards are beautiful - the colouring is fabulous! Absolutely beautiful cards! Love your gorgeous coloring! I love the wreath you made and the pretty background design and color! Lovely card with the Peony Dreams image also! How cool to take just the bud of the fab Peony Dreams and frame it up like that!! Love 'em both!! SQUEAL!! LOVING the NEW Products!! CONGRATS on your NEW Die!! I LOVE your BEAUTIFUL Cards and the SNEAK PEEK!! lol THANKS SO MUCH for sharing and have a FABULOUS WEEK!! Wow! I'm in love for your gorgeous cards and colouring!!! JJ, what a way to finish the hop. Love your gorgeous projects!!!!!! Love the lady resting in the flower. Great finish to a great hop! Your cards are very pretty. Thank you so much for sharing your talent!! So beautiful, you are a fabulous final stop on the hop! I especially love your second card - so beautiful! I just love the peony dreams set. It is so imaginative!! Also the Be YOU Tiful set is so versatile!! Great job on these!! Gorgeous cards!! Really love the that background die! Congratulations on the diamond die it's awesome & will be a fabulous addition to my die collection. You're cards are so pretty & colourful. Thank you for sharing your ideas. Lol on the sneak peek! I was wondering about that! I'm loving your new cover! I love your sweet peony card. I love the colors you chose and the layout of the card. The girl in the flower is so unique and fun. Pretty cards. My fave is the one with the wreath. Wow! I just LOVE the pretty lilac shades of your fairy in the flower card! It feels exactly like spring! My favorite from the entire hop! Thanks! Wonderful floral cards. I love the Brilliant Blue you have on the first card that makes the flowers really stand out. How pretty! Love the background too! Thanks for sharing your two pretty floral cards!